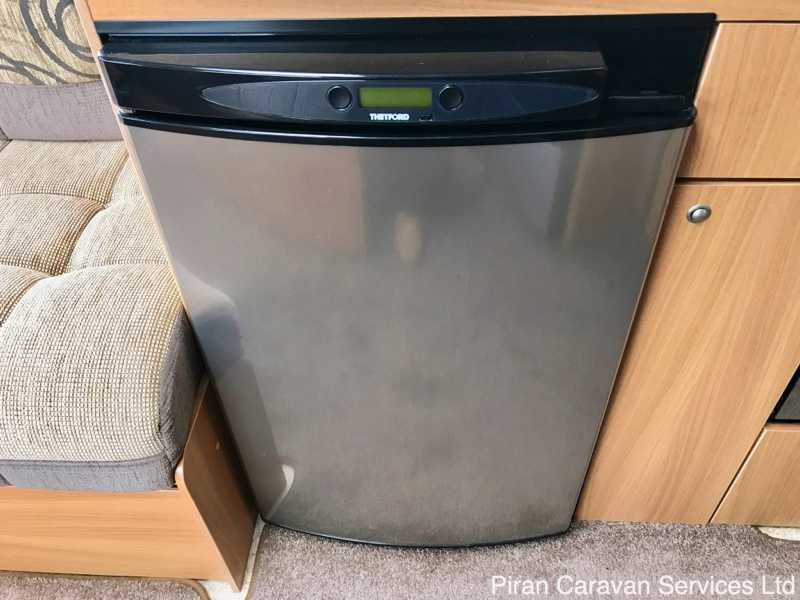 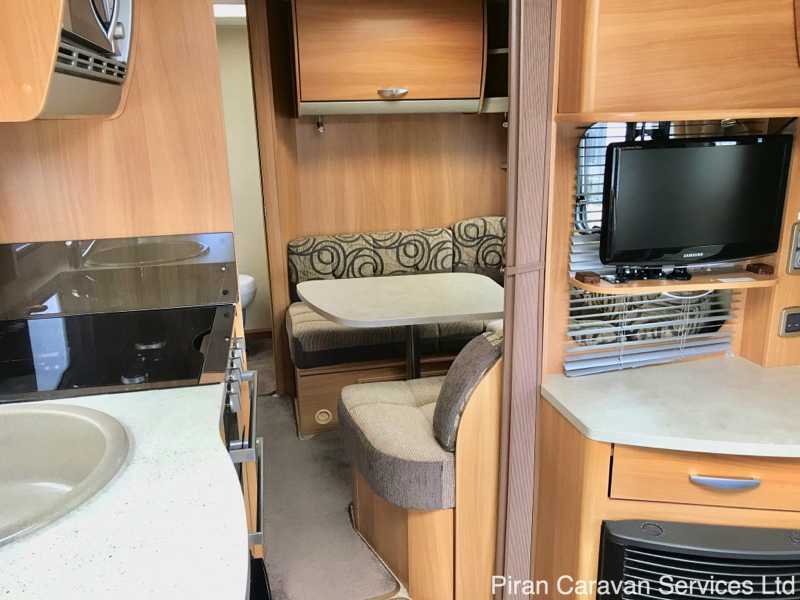 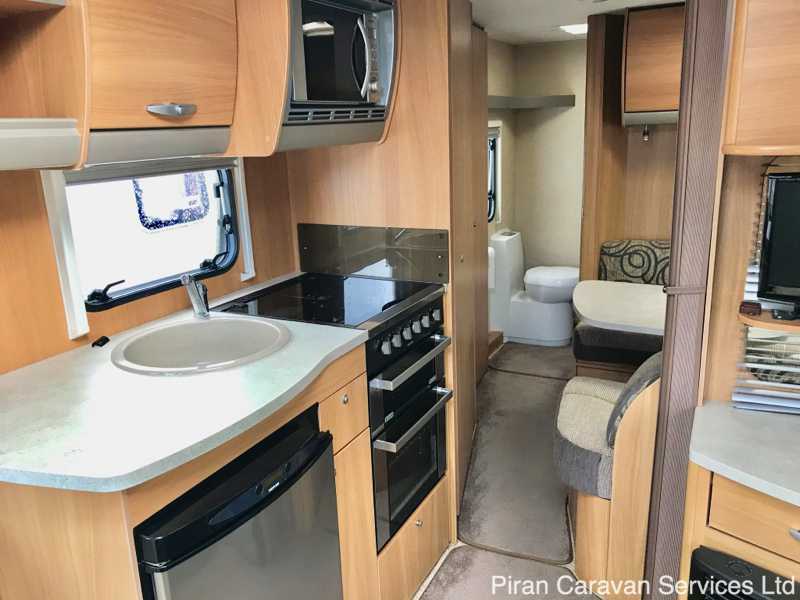 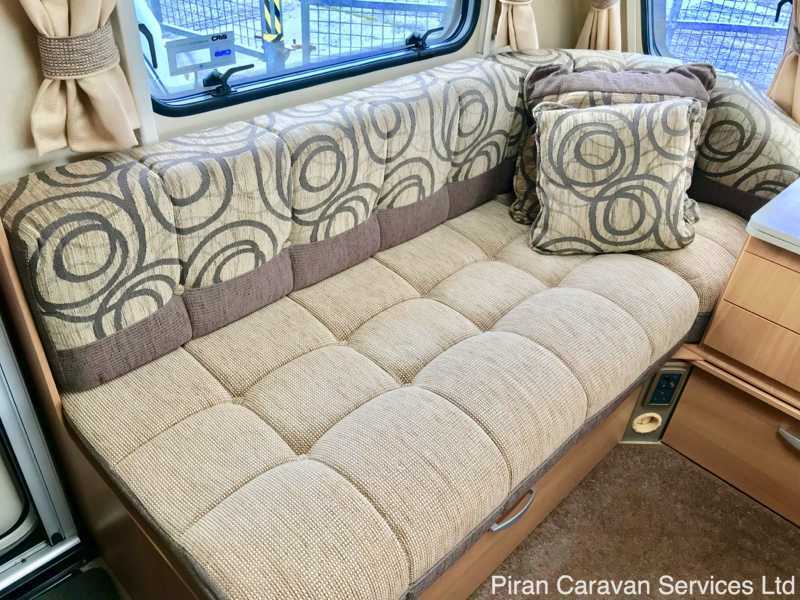 If you're looking for a family 4 berth tourer on a single axle, with a double lounge layout AND a large rear washroom, which is perfect for families with children, this caravan will meet your needs. 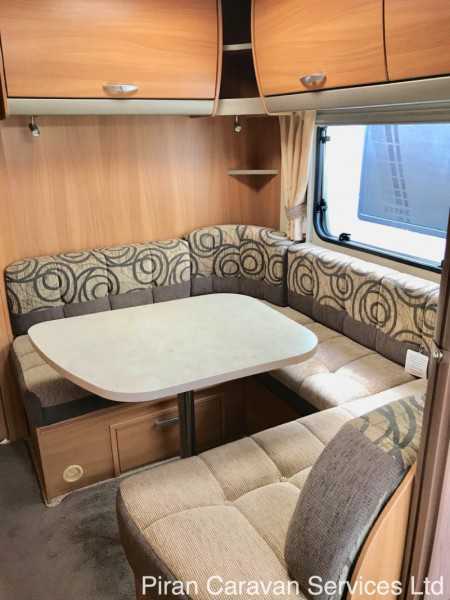 This attractive 4 berth Swift Coastline 545 is in excellent condition, having been well-cared-for by its 1 owner. 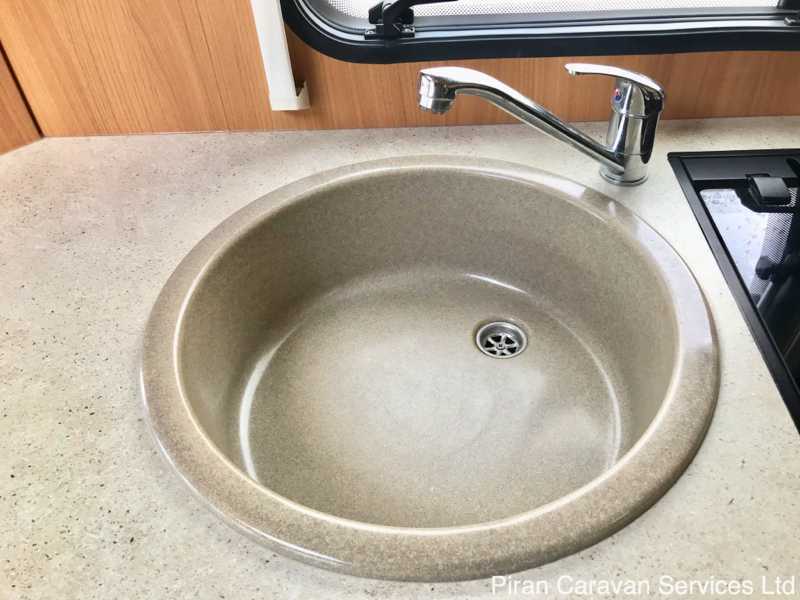 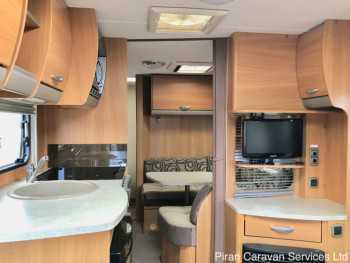 Based on the Swift Charisma range, the Coastline is a dealer special edition, exclusive to Highbridge Caravans, and featuring upgraded equipment and furnishings. 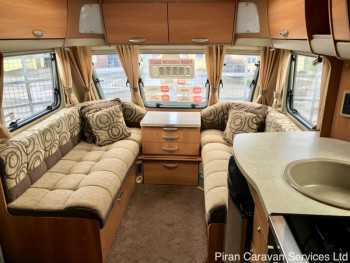 It has been fully valeted inside and out and will have been serviced and damp checked, providing peace of mind for a new owner. 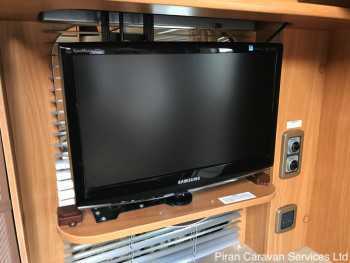 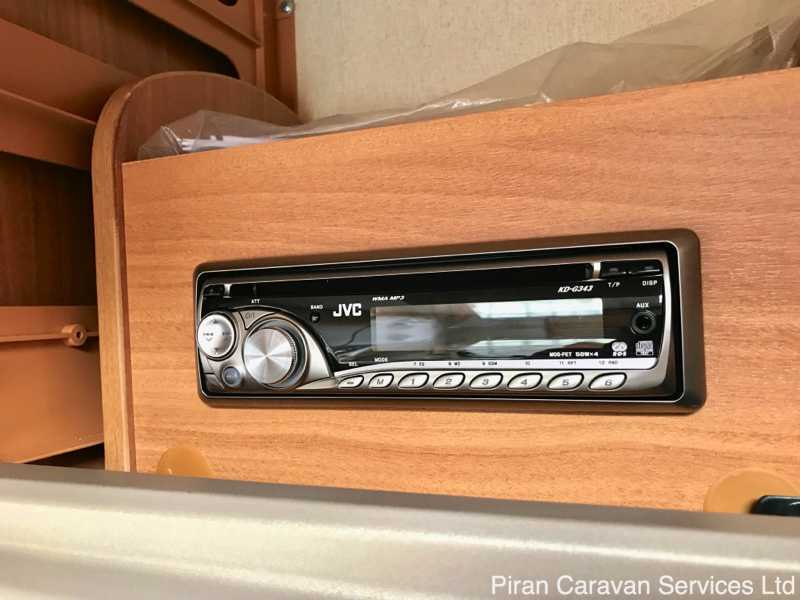 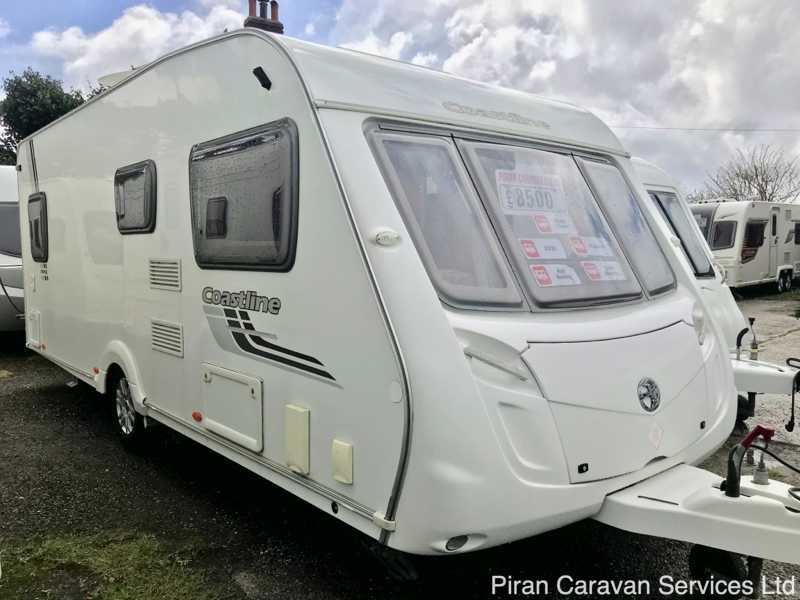 It is Cris registered and the caravan comes complete with all the manuals, paperwork and service history (all services completed by an approved workshop). 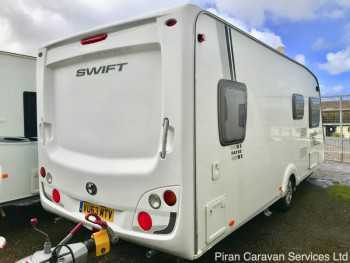 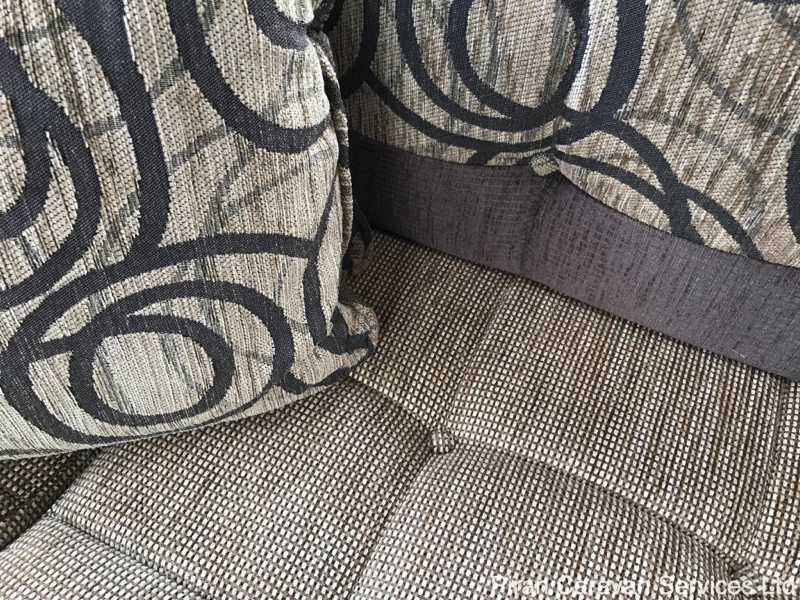 This Swift Coastline has been well cared for and only had very light touring use. It comes with lots of essential caravanning extras, including a Powrtouch remote control motor mover (checked and working), an Isabella 3/4 awning, Bull Dog and Alko hitchlocks and wheellocks, Aquaroll, Wastemaster, hook up cable, lightweight gas bottle, waste pipe, levelling ramps, towing mirrors, hitch cover and a recent leisire battery, making it fantastic value at this price. 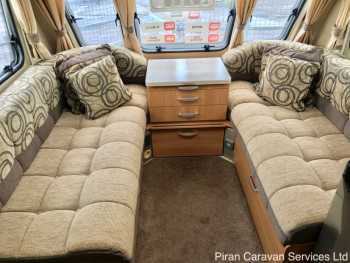 Its perfect for a couple wanting a spacious carvan with 2 separate living and sleeping areas or a family with 2 children. At the front of the Coastline 545, 3 double glazed panoramic windows give a light and airy feel to the spacious lounge area which has pocket sprung seating which can be used as two single beds or as a large double utilising a pull-out slat system mounted under the chest of drawers. 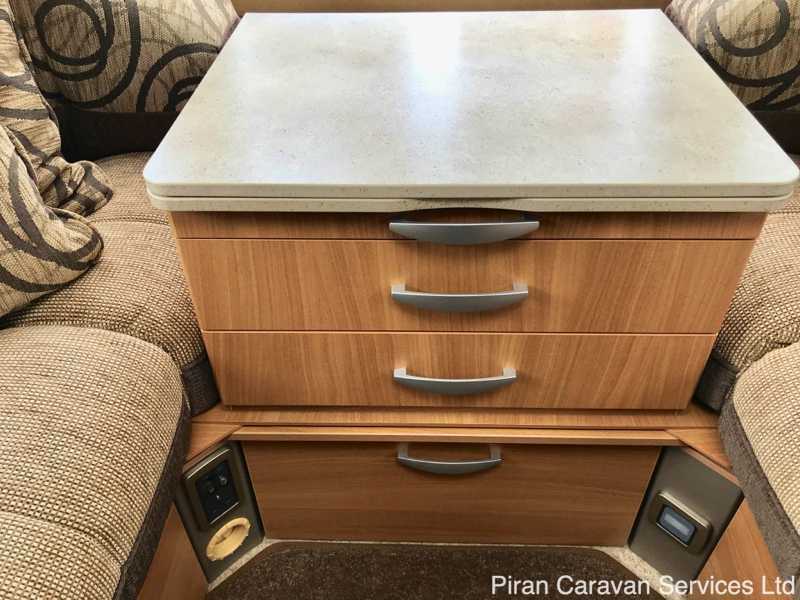 The drawer has a handy fold-out coffee table. 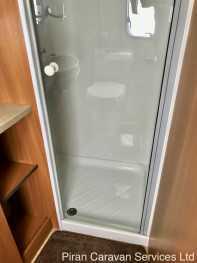 There is plenty of storage in the spaceframe design overhead 'aircraft-style' lockers and also under the seats. 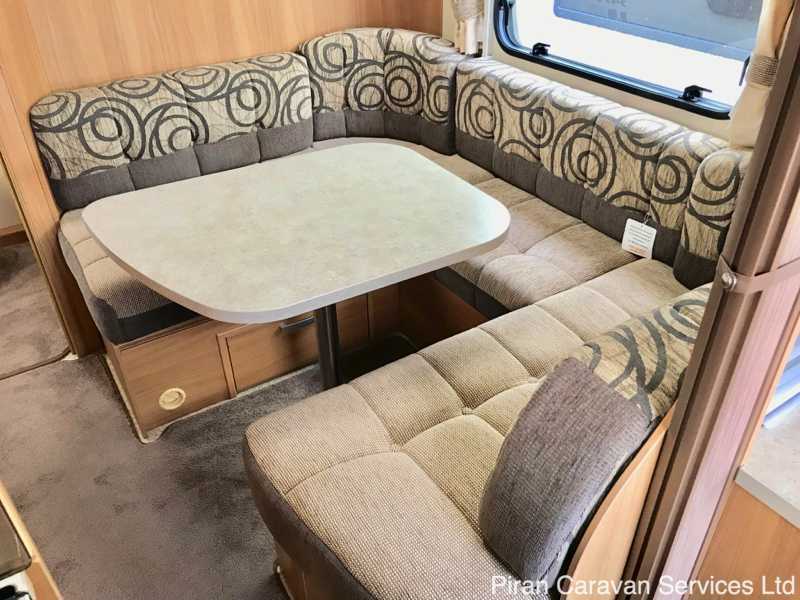 Above the sitting area is a large Heki Roof light providing fresh air ventilation and light when required. 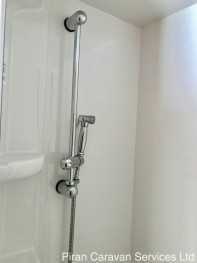 all the windows feature blackout blinds, flyscreens and night-ventilation latches. The soft furnishings are in a neutral cream and beige colour and of a contemporary design and are complemented by matching scatter cushions and curtains. 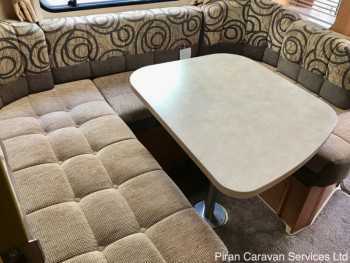 The carpets are detachable and there is a wood effect vinyl flooring underneath. 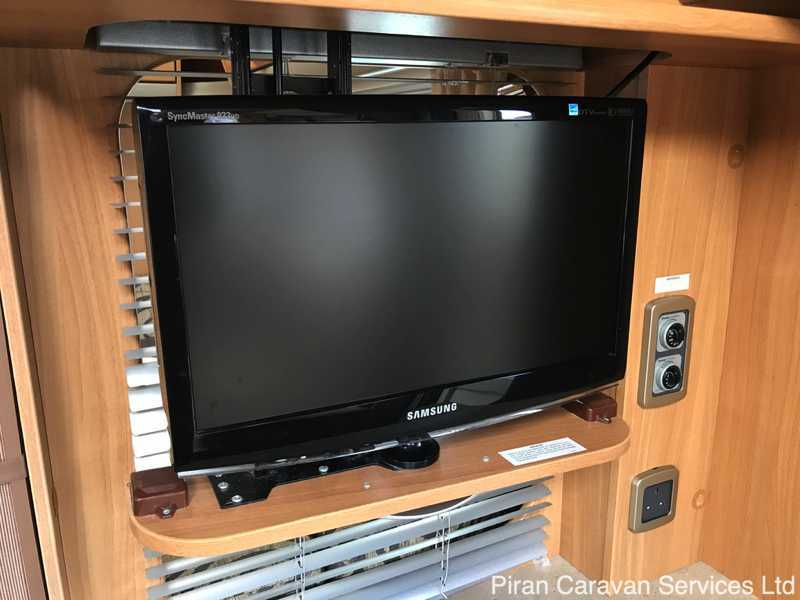 There is an extra TV point (with 12v, 240v and aerial sockets). There is a built-in Blaupunkt CD/radio/MP3 player for your listening pleasure. 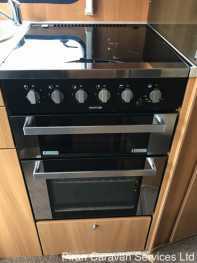 A well-appointed kitchen is positioned in the middle section of the Swift Coastline and features a Stoves four ring hob (3 x gas and 1x electric 800w hotplate), Stoves thermostatic grill and oven, built in Sharpe microwave oven and 107 litre Thetford 3-way fridge with ice box, featuring digital controls. There is also a recessed stainless steel sink with chrome mixer tap. 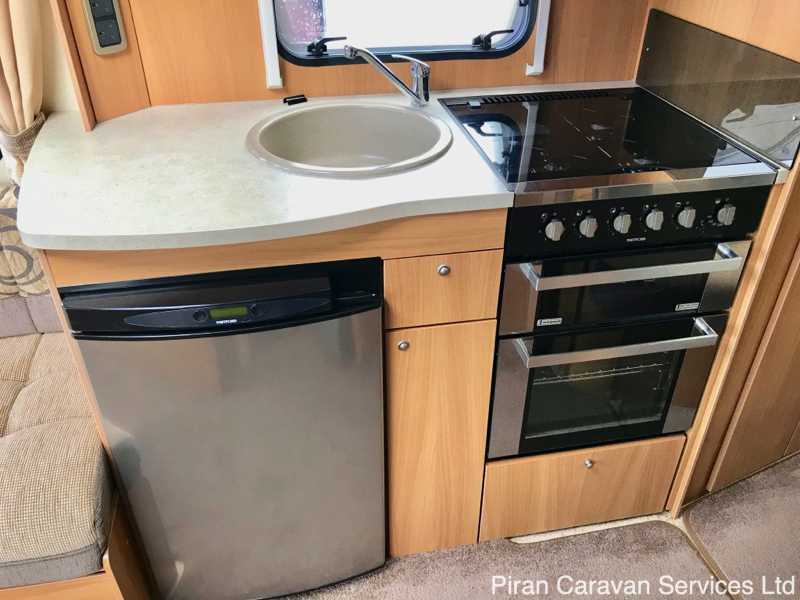 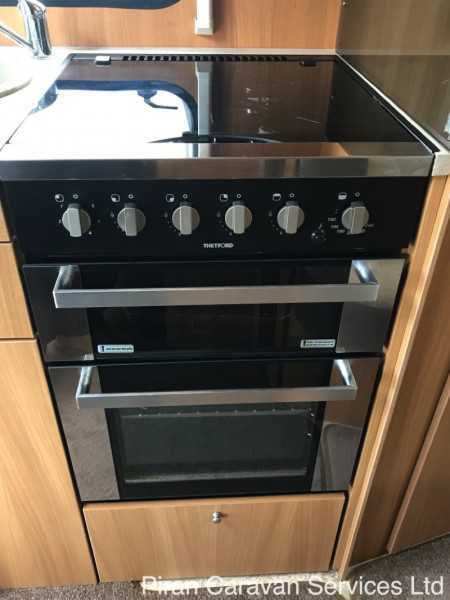 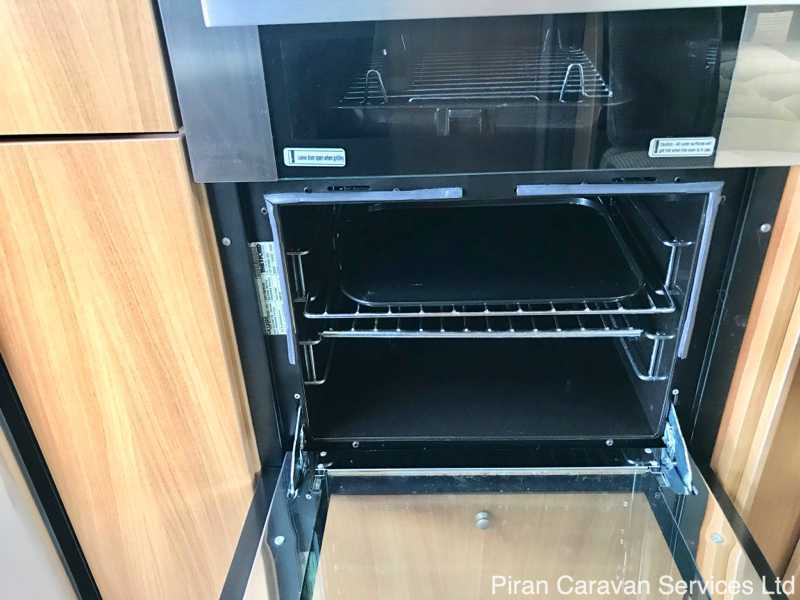 There is ample food/utensil storage space including a molded cutlery drawer and slide out storage rack and plenty of worktop space for food preparation. 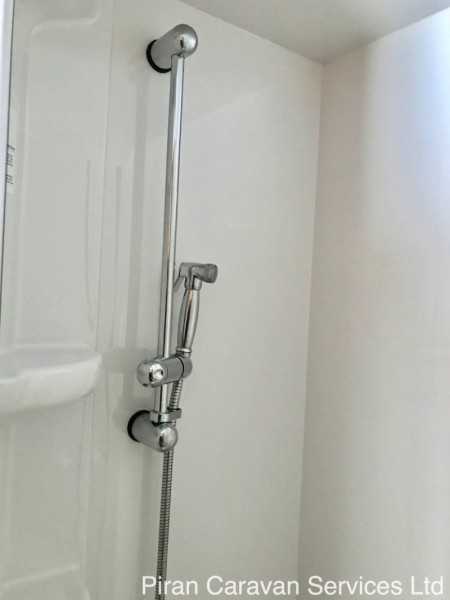 In the ceiling above the kitchen is an Omnivent bi-directional, 3 speed extractor fan. 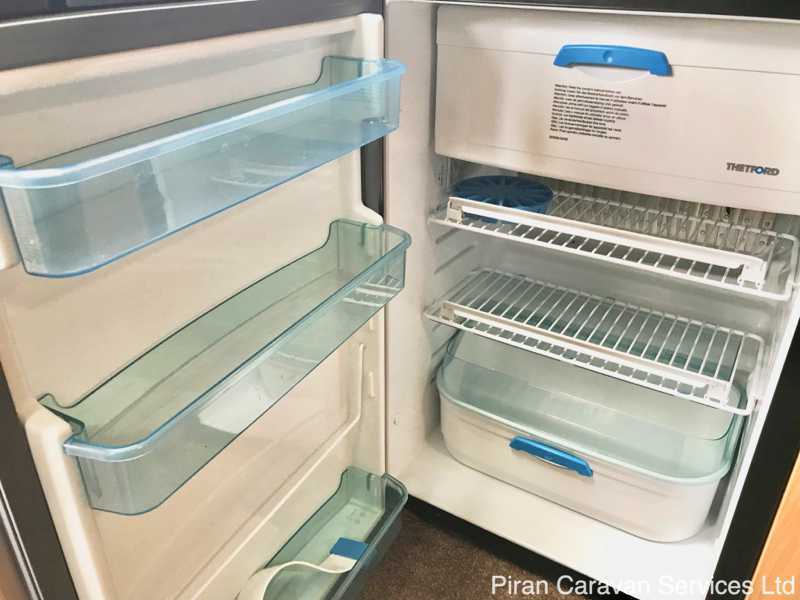 Opposite the kitchen are cupboards, shelves and more useful work space. 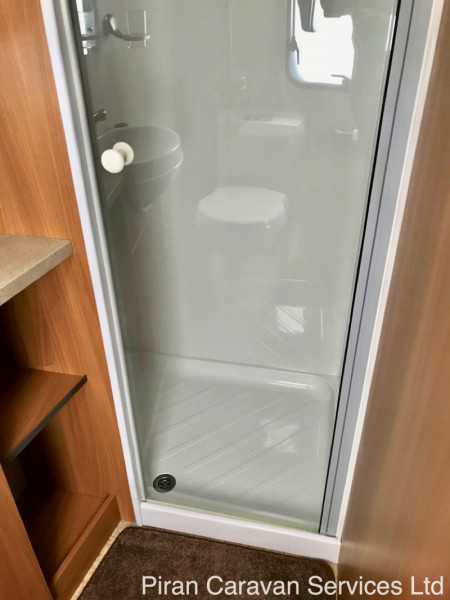 In the rear of the 545, a domestic-style door leads to the is a spacious and well-appointed bathroom which features a large walk-in shower cubicle with chrome shower head and mixer tap. 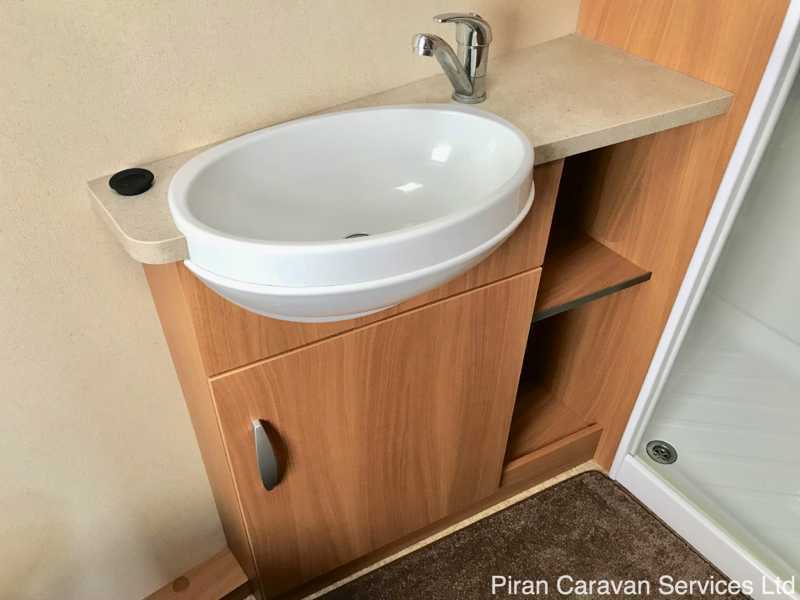 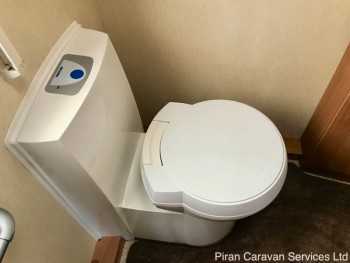 The bathroom is also equipped with a Thetford C-250 swivelling cassette toilet with electric flush, wash basin with chrome mixer tap, vanity unit with mirror, and additional cupboards. There is a factory fitted Powrtouch remote controlled motor mover, making siting the caravan a breeze on even tightest of pitches. The caravan comes complete with a large number of expensive extras including an Isabella 3/4 awning with curtains and groundsheet, hitch lock x2, wheel clamp, Alko Wheel lock, Aqua Roll, Wastemaster, 25m electric hook up cable, 1 x gas bottle, levelling ramps, towing mirrors and a leisure battery. 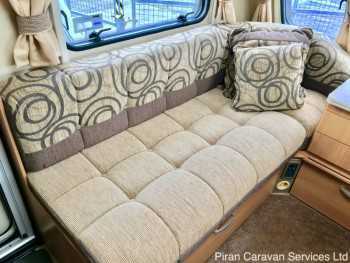 In summary, this is an exceptionally well looked after 4 berth caravan which is easy to tow and tour with. 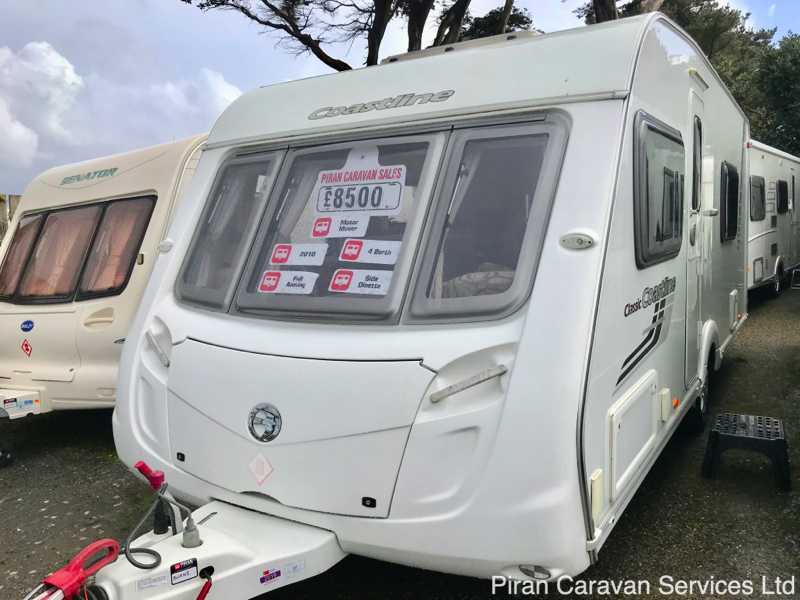 The layout makes it ideal for a couple or a family wth children looking for a spacious tourer at a great price and the awnings and extras included in the sale, as well as the peace of mind provided by a full serivce and damp-check, make it fantastic value for money at this private sale price. 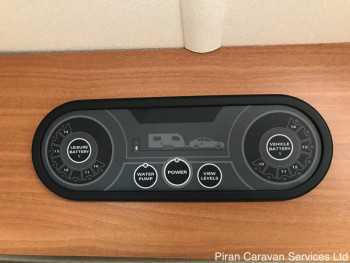 To check if your car would be compatible go to www.whattowcar.com .